This is Henry, one of approximately 30 leafy seadragons known to reside in Rapid bay. Nikon F90X in Nexus housing, 60mm, twin YS30 strobes on TTL, Velvia. Manual mode, 1/250th @ f16. 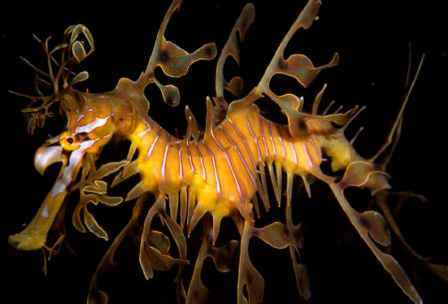 Henry, a rather handsome Phycodorus eques, or leafy seadragon to you and me, lives around the wreckage of a collapsed ladder under Rapid bay jetty in South Australia. Recognised by his unique facial markings, he can normally be found in the same vicinty, doing what leafy seadragons do best. That is, trying to blend in with the surrounding seaweed, feeding, and probably doing his darnedest to avoid the attentions of underwater photographers like myself. We're not sure if Henry realised it, but it was him and his sort that had brought Angela and myself here from Melbourne. After living there for the past six months we'd seen the local weedy seadragons around Port Phillip bay as well as in Sydney. But leafys only occur over a narrow range, from Portland in the west of Victoria to Lancelin in West Australia. 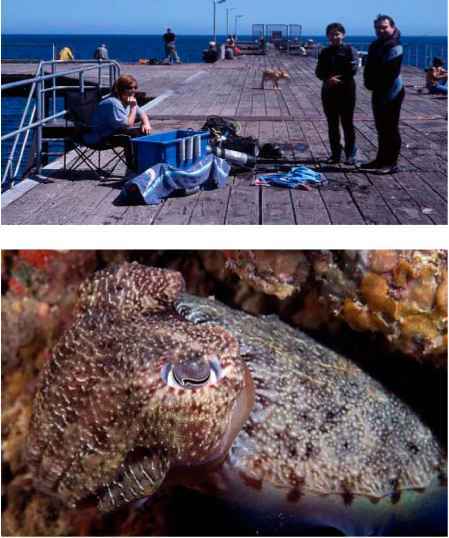 Smack in between lies South Australia and a famous dive site known as Rapid bay jetty. Always enjoying a good pier or jetty dive, the fact that there's a healthy population of leafy seadragons there was all the extra incentive we needed. So, with a long weekend off during late March, we found ourselves driving the 1000 km's or so from Melbourne to Adelaide, on our way to meet Carey Harmer of Sea Optics, Adelaide. 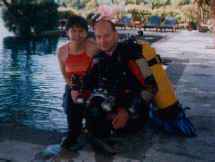 We'd arranged to meet up with him our first morning after he'd offered to join us on our first few dives on the jetty. Carey had lost count on just how many dives he had done on the jetty. With the seadragon database he had contributed to over the last ten years or so, he was familiar with many of the leafys, hence how we would soon find ourselves introduced to his old mate, Henry. Ceratosoma brevicaudatum. These are the most common nudibranchs around the jetty and get pretty big. This individual was around 10cm long. Nikon F90X in Nexus housing, 60mm, twin YS30 strobes on TTL, Velvia. Manual mode, 1/250th @ f32. Small scale bullseyes congregated in small groups like this around the jetty pylons, occasionally joining a large school beneath the centre of the jetty. Nikon F90X in Nexus housing, 16mm fisheye, twin YS120 strobes on TTL, -1.5EV, Provia. Manual mode, 1/60th @ f11. 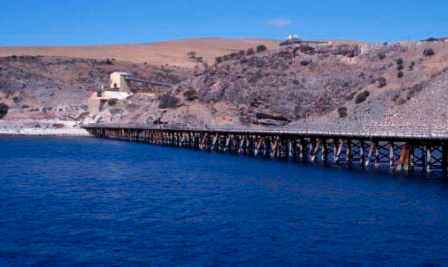 Rapid bay jetty is well over 400 meters long. Dependent on how far away you've parked, you're in for at least a 500 meter hike each way. Aha, enlightened? Hats to wear for the walk out there, a trolley to transport the gear on, padlock and chain to affix the trolley to the jetty whilst diving and the rope? OK, so there's no easy access to the water - rope to dutifully lower cameras into the water. Of course! By now we were suited up, gear lashed to trolley, hats on, and boy, were we sweating! Unfortunately our borrowed trolley soon died - something to do with the width of the wheels being narrower than the gaps between the planks on the jetty! Doh! - back to plan B for today at least, the manual method. Taking us twice as long, and twice as many trips, to reach the end, we had at least twice as many inane comments from all the 'fishos' lining the top of the jetty, along the lines of "going diving mate? ", "whaddya see down there?" were countered by "caught anything yet mate?". Nikon F90X in Nexus housing, 60mm, twin YS30 strobes on TTL, Velvia. Manual mode, 1/250th @ f16. cool down. We gathered the cameras, a quick leak check, then headed down to meet on the bottom, some 30 ft below. The substrate was made up of coarse sand, small rocks and rubble with larger debris directly beneath the jetty. Looking toward shore we could see an expanse of seagrass ended somewhat abruptly near the edge of the jetty. The wreckage of a large 'A frame' was situated below the entry platform, topping out at around 15ft. Due to a recent storm the water had been a little churned up and visibility hovered around 30ft or so. Not as much as we'd hoped for, but due to the sediment from the quarry and often variable conditions, it was apparently never entirely predictable. Still, with a 60mm lens on for this dive, it didn't prove to be problem. Once we became accustomed to the conditions we started to investigate the seaweed covered 'A frame'. We'd been told leafys sometimes hang out there but although we couldn't find any, around the base and the nearby seagrass were an abundance of weedy seadragons. We'd seen weedys before but never quite so many in one place. Interestingly they all appeared smaller than those we had seen in Victoria and New South Wales. We later found out that cold-water specimens often grow larger than their warm water counterparts. Of course, they were no easier to shoot, keeping a respectable distance between any diver and a tendency to stay sideways on -but there were plenty of opportunities to try different approaches. Moving on under the jetty we came across more fish hiding amongst the seaweed encrusted pylons and patchy covering of seagrass. 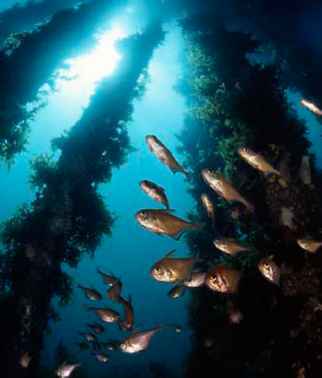 Boarfish, old wives, yellowtails, perch, leatherjackets, puffers, cowfish and a variety of wrasse used the profuse kelp cover to their advantage. 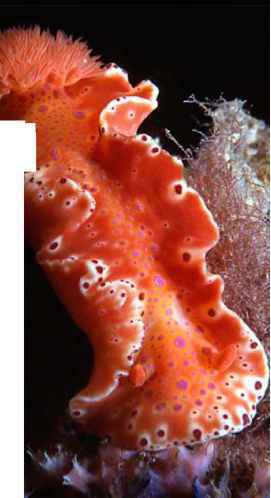 Looking closer we found beautiful sponges, ascidian colonies and patches of bryozoans, crabs scuttled out of the way and a variety of nudibranchs, well, didn't. For nudi lovers, a number of species were prevalent and considered common here. Huge Ceratasoma brevicaudatum, Chromodoris tinctoria and Flabellina species were easy to find. On the starfish peppered bottom a multitude of goatfish and Magpie perch cleared the way for us as we kept our eyes peeled for flatheads and harder to spot stargazers that are known to reside there. Before we found any of those however, we came across Henry! This is one of a pair of cuttlefish, possibly broadclub cuttlefish, that we would find every day either sheltering or laying in wait in the exact same place and almost perfectly camouflaged.Nikon F90X in Nexus housing, 60mm, twin YS30 strobes on TTL, Velvia. Manual mode, 11125th @ f11. had informed us as to how delicate leafys are. If they get too stressed out they may suddenly die. Also, if they are made to change even moderate depths quickly, their swim bladder can rupture. We had heard and read horror stories attesting to this. Photographers who had 'held on' to the tails of a seadragon to get a shot, only to see them keel over afterward. Snorkelers who would dive down and bring live seadragons up to the surface to show others. Other photographers who would shepherd the seadragons into suitable positions for a shot. Needless to say, we had already decided to take only a handful of shots of any single subject that we found so as hopefully not to cause too much trauma. In the end, we found that as long as we were patient, slow and moved carefully around the environment, we could get suitably close to Henry for full body shots and close-up's. Leafys can't move too quickly and seem to prefer to depend on their camouflage, tending to stand their ground until you get unreasonably close. Which proved to be close enough for 20, 60 & 105mm lenses. However, they also tend to stay sideways on to any 'threat' making head-on shots harder with shorter focal length lenses. To be honest though, they are a gift to photographers. With a striking green to yellow (variable dependent on location) and white colouration, they look great if shooting for black or blue negative space. The typical leafy 'movement' also makes them perfect candidates for slow speed sync. shots. Nikon F90X in Nexus housing, 20mm, twin YS120 strobes on TTL, -1.5EV, Provia. Manual mode, 1/15th @ f11. Rear curtain sync and slow shutter speed. platform (found when I had the fisheye on! ), a large southern fortescue, small school of squid and huge flatheads. We also saw a large fiddler ray, unfortunately it was on the other end of a fishing line. Which leads to our other 'findings'- that of a new fishing reel, multiple squid jigs and lures, and a nice blue hat. We left everything but took the hat as a momento! In a similar vein we 'rescued' a goatfish and wrasse that were both hooked on a broken trace - shears are more than handy when diving here! Our only regret was not doing a night dive. The near two-hour bottom times and two or three tank a day dives combined with the walk to and from the car meant that a beer and meal at the pub always won out! Still, gives us something to return for doesn't it? And to see how Henry's getting on eh? Rapid bay is about 100km and a few hours drive south of Adelaide. Apart from a campsite there is little other accommodation near the jetty. We stayed at Dolphin dive in nearby Normanville. Simple but comfortable accommodation above the dive shop made it easy to pick up tanks and fills etc. They also hire out wetsuits and the range of gear at reasonable prices. Dolphin dive went out of their way to ensure we had a good time (including lending us their trolley when ours died). Normanville also has a few nearby B&B's, a small motel and numerous cafe's as well as a pub for food. Dolphin dive can be found at www.oitafe.com.au/ Dolphin_Dive/ . The bay can be dived year round. Best conditions are found when winds are from the east or southeast. Northerly winds can cause a lot of swell and reduce visibility to near zero. Water temp. peaks in summer at around 21 degrees, dropping to around 12 degrees in winter. 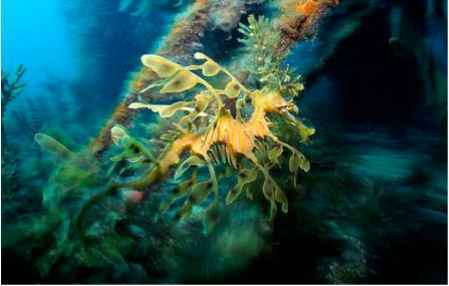 Diving is also highly rated around Kangaroo island and the York peninsular so you can easily base a dive holiday in the region. The jetty becomes busy at weekends and there are queues at the platform as well as around anything interesting (including leafys) underwater. 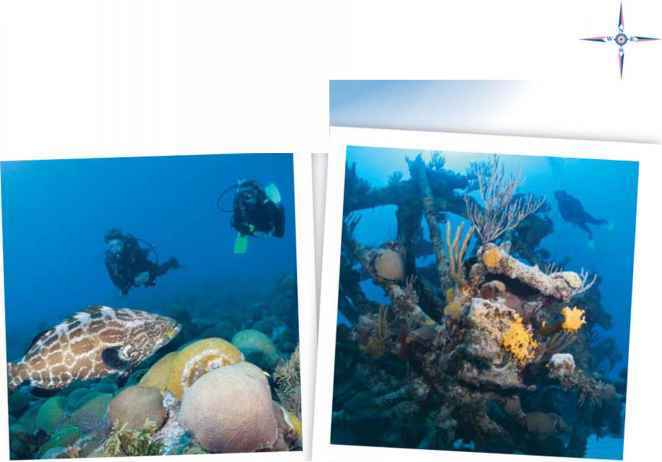 We suggest you plan to dive weekdays if at all possible. The shore, and the approach, is quite rocky with a shallow gradient. Shore entries and exits are possible but could be very difficult if carrying equipment. Be prepared to share the jetty with the 'fishos' or fishermen. Be careful of the lines, take a pair of shears and pick up any rubbish you find. The most memorable thing, apart from the diving, tends to be the amount of dust generated by the active limestone quarry (which the jetty used to serve for loading/unloading). After three days diving we had dust virtually everywhere, including coating the inside of the camera and housing so prepare for that. 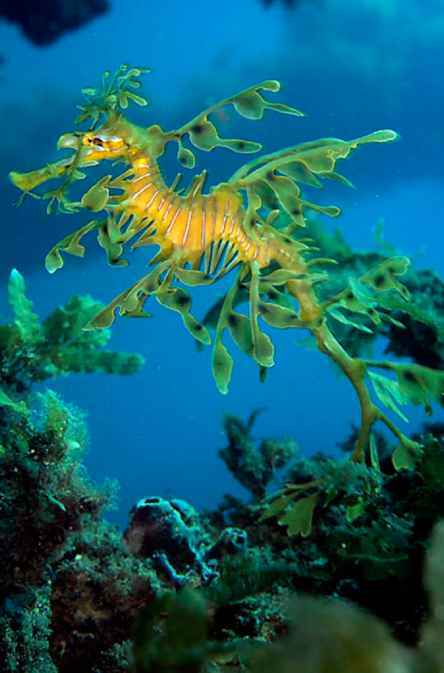 You can check out www.seadragon.org.au for a guide on seadragons as well as a code of conduct when diving with them. For information on diving Southeast Asia, underwater photography & the Motormarine IIEX:- Just add warm water to A & A instant divers!! !